4. LOW-HEAD DAMS - Over the years, we have observed that the greatest rates of mass wasting occur: 1) when soils are saturated with water, and 2) when the river level is low. Because the Red River is a manipulated river (operations of dams upstream often control outflow), times exist when the river level at is low even at times of high soil moisture conditions. Our maps of problem areas in the Fargo region show a related phenomenon: slopes in pool areas above low-head dams show little propensity for large-scale failure. Indeed, much of the area of east-central Fargo has shown no indication of slump development, even during saturated soil conditions. We suspect that the dams are affecting the rates of slope instability in two ways: 1) in the pool area, a constant water level serves to induce continuous hydraulic pressure against the channel walls, slowing clay flow toward the channel, and 2) the velocity profile of the river is "evened-out" across the channel because of the presence of the dam. Because water spills over the lip of the dam at a uniform rate, erosion is no longer concentrated at the cutbank positions of meanders within the pool region. Although dams seem to be effective structures at reducing mass wasting rates, it is unlikely that any more will ever be constructed along the Red River. Dam construction is expensive, and the placement of dams on the Red requires an approval process involving two states plus the federal government. Dams have a negative impact on fish movement. They are also dangerous (many drownings have occurred on local dams) and inhibit the development of other recreational uses for the river. In some areas, the presence of a dam could negatively impact water quality; such, for example, would probably be the case if a new dam were to be installed at the north edge of Fargo. Upstream of this dam near 12th Avenue North, the rates of slope instability are markedly reduced. 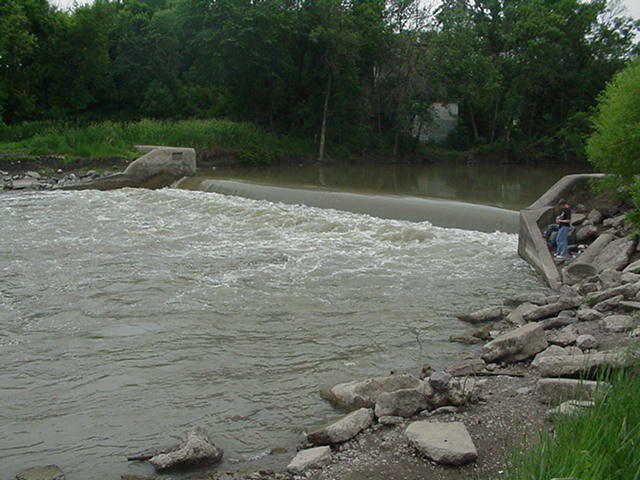 Dams can be effective engineering structures to remediate problems with mass wasting along the Red River. However, there are many problems associated with dams, and hence the construction of additional dams simply to relieve slope instability should not be encouraged.